Published in Rafu Shimpo, October 10, 1968, English and Japanese sections. 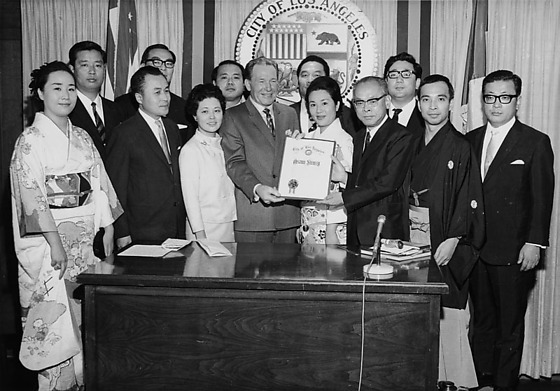 Los Angeles Mayor Sam Yorty presents a proclamation to Osamu Shimizu, Kabuki song score composer and shakuhachi player, surrounded by the Nikikai Opera Company of Japan, in Yorty's office in Los Angeles City Hall, Los Angeles, and troupe after performance of Kabuki play, "Muko-Erabi" (The Marriage Contest), at the Santa Monica Auditorium, Santa Monica, California, October 9, 1968. Includes Kyoko Ito, the soprano and star of Nikikai; Dr. Jan Popper of UCLA, conductor; Yoshijiro Hanayagi, choreographer and dancer; Hiromitsu Nagauma, director; and troupe members Risaburo Tsukiji, Keiko Yano, Kiyoshi Oda, Tadahiko Hirano, Takeshi Nakamura and Katsumi Niwa. 1P and 4N: Mayor Yorty, a Caucasian man in suit, smiles as he holds a proclamation certificate with Osamu Shimizu, a Japanese man in suit and eyeglasses, in Yorty's office. A Japanese woman in kimono, Kyoko Ito, stands between them. They are surrounded by ten Japanese men and women in kimono and suits. Microphone on desk in foreground. City of Los Angeles emblem hangs in front of curtains, flanked by American and California flags in background. 2P-3P, 7N, 11N-12N : Troupe members in costume socializing with audience. 5N: Portrait of Shimizu in tuxedo with eight members of troupe in costume in front of stage props. Shimizu and Ito in kimono hold bouquets of carnations and roses, respectively. 6N: Shimizu in tuxedo stands with conductor Dr. Jan Popper of UCLA, a white haired Caucasian man in tuxedo flanked by four men and women of troupe in costume in front of stage props. 8N: Shimizu in tuxedo bows on stage holding a bouquet of flowers next to Dr. Popper, a white haired Caucasian man, center, and Ito, a woman in kimono holding bouquet of roses. They are flanked by seven troupe members in costume. Stage props in background. Orchestra in foreground. 9N: Woman in kimono presents a bouquet to Dr. Popper, a white haired Caucasian man in tuxedo, on stage. 10N: Portrait of two Japanese women standing side by side. Woman on left, Ito, holds a bouquet of roses. Woman on right holds a purse and paper in her proper left hand. Typed on original negative envelope: Niki Kai Opera -- at Mayor's Office.